As the winter chill creeps into the Florida air, the torpedo-shaped manatees, head inland from the gulf to find warmer places to hang out with their friends. 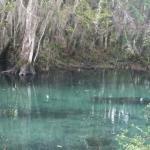 Now is the time to go manatee spotting, and you are sure to find more than just one enjoying the Florida spring waters. 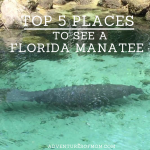 And so with that in mind, we offer you the top 5 places to find a manatee. Be sure to bring a camera! So while others headed out to bag their winter venison, out we went, armed with cameras, hunting for manatees, the cows of the sea..